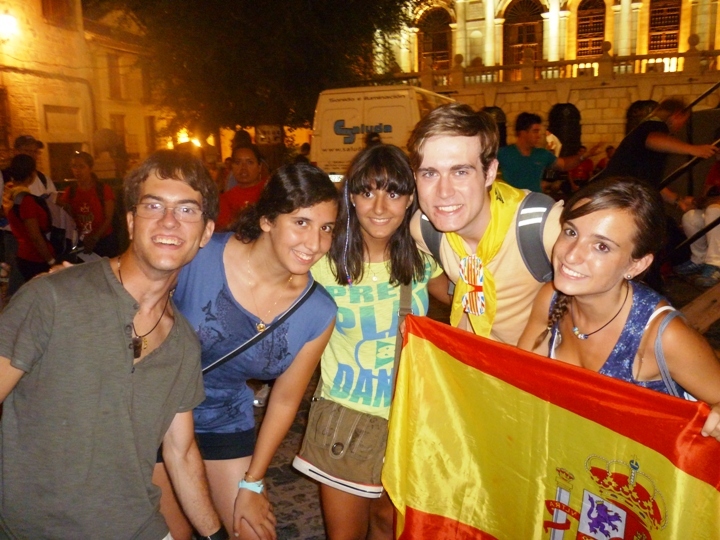 In August 2011, I attended the World Youth Day celebrations in Madrid, Spain. A week of joy and celebration with millions (literally!) of young Catholics, our group spent a weekend with host families in Toledo before moving onwards to Madrid for a week long fiesta with Pope Benedict XVI. It’s been over a week since I returned from Madrid, and I’m still processing exactly what it was that I experienced out in Spain. The entire trip was such an energetic collection of encounters which started off in a small Church in Toledo and culminated in a gigantic open-air Mass on an airfield in Madrid. I was given the opportunity to try traditional foods, learn the Spanish lingo and meet people from particularly obscure countries many of us had never heard of before. After setting myself the challenge of spotting CAFOD partner nations, out of the 40 possible, I only managed to meet people from nine of the partner countries – Brazil, Colombia, El Salvador, Guatemala, Kenya, Lebanon, Mexico, Nigeria and the Philippines – although I did meet people from a further 36 countries in total. My favourite had to be El Salvador, the nation whose national hero is a CAFOD icon and a strong inspiration of mine for speaking out about civil violence within the country which lead to his assassination in 1980. Upon meeting, we realised immediately that we knew neither of each other’s language, so we managed to have a very hand wavy conversation which just about conveyed that we were from the United Kingdom. And although we weren’t sure what the Spanish word for “hero” was, I think they got the general idea what we meant when we screamed “Oscar Romero” at them, and beat our heart with our fists. Another highlight of the trip was the daily catechesis sessions which ran at the “Palacio de Deportes”. 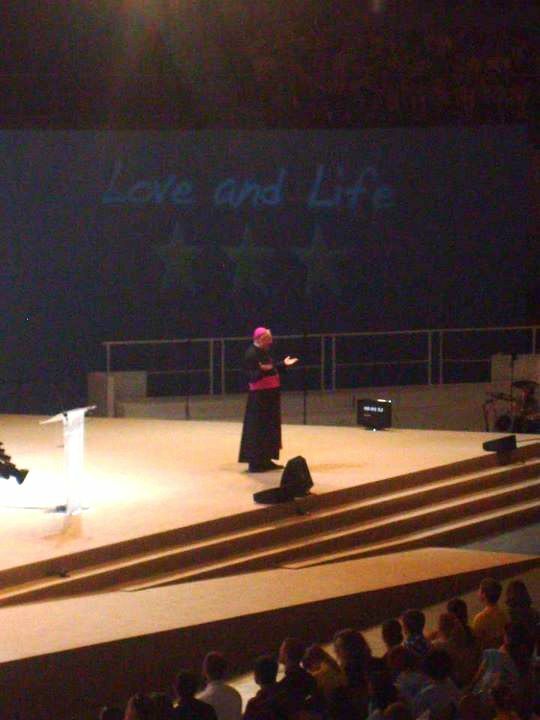 The theme was “Love & Life” and my favourite speaker was the Archbishop of New York, Fr. Timothy Dolan. He took us through the four most important ways to spread the Good News: charity, joy, hope and love for the Church. With my passion for social justice, I was particularly struck by Dolan’s remark that, “We are most nobly human when we give ourselves away in love to others.” This captures everything I believe about charity and Christianity; Christ calls us to forget all our worldly possessions, and start accepting the call of love. “Love one another, as I have loved you.” And sure, this may seem like a deviation from the norm in today’s society, and our peers may think we’re strange for not going after the most cut throat, or best paid job. But what I realised from Dolan’s talk, is that although the Christian way might not be society’s way, as Dolan best puts it, giving ourselves away in love to others is surely the “nobly human” way. What a guy! 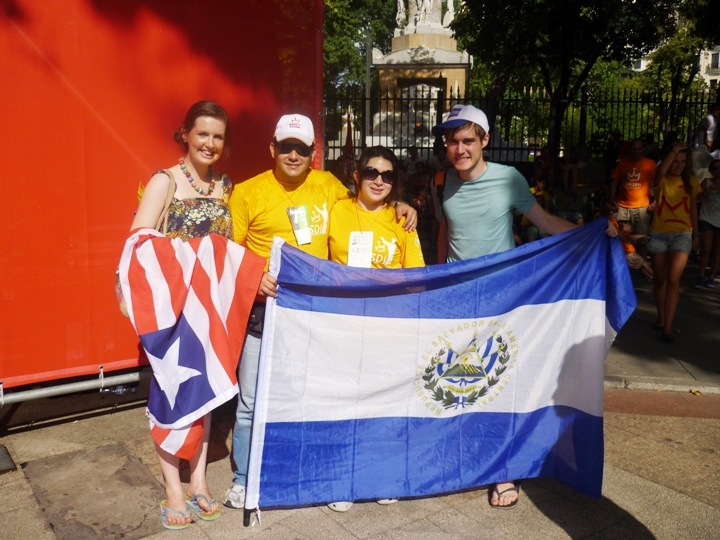 My experiences at World Youth Day were everything I expected them to be, and so much more. The huge crowds were there, the celebrating was there and the youth solidarity was there. I was able to meet young people who had spent a year doing youth ministry in their Dioceses back in America and other young people from Ghana who were representing a youth Don Bosco movement, similar to a group we met in Liberia. 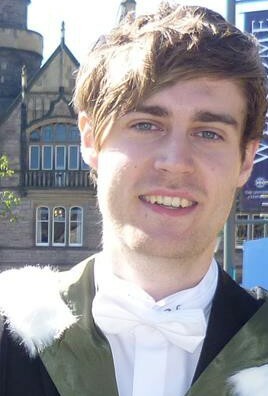 I met young people from France who could understand my Scottish friend’s accent better than my own Geordie one, and other young people from almost every country who were asking, out of genuine concern, after the English people who had experienced the London riots. I chatted to another guy called Michael who had come from Syria, and spotted young nuns from Kazakhstan crossing the road. There are endless stories, for an endless number of countries. Looking back, the things I will take away most are not just the stories, but the friendship and love that underlies all of them. Although meetings were often brief, and sometimes we only had time to pluck from our distant memory a “hello” in a language we learnt a long time ago, somehow it was just so natural. Nowhere else, have I been able to chat to random South Koreans on the train or wave to a group from St. Lucia as we pass in the street. Young people were open to talk to other young people, from different cultures, from different backgrounds, from different walks of life. And it was easy. No murmurs of, “we have nothing in common” or “they don’t speak our language”. For the most part, we most probably will never see or speak to each other again, but for that fifty seconds walking down a street together there is a connection made – friendship in its simplest form. So, I look to the future and encourage any young person who has read my recent blogs to start considering whether or not they may want to attend a World Youth Day event. The next one is in 2013, and is taking place in Rio de Janeiro and I pray to God that everything aligns so I can be there myself. Events like these make the world an exciting place to be a young person; we can all be a part of this “great generation” which works together to “give ourselves in love” and bring much needed change in a place which is full of so much tragedy, so much sadness. So let’s celebrate the fact that we’re young people, let’s celebrate the fact that we want to make this world a better place, and let’s celebrate the fact that there are millions of us across the globe who can work together in spite of language, culture or geographical barriers to really make a difference and change our world. It is two o’clock in the morning and I am lying on on a concrete runway in Madrid on the sleeping bag I brought all the way from Whitley Bay. I am with one of my good friends from school who I have known for almost a decade, friends I have met over the last two years working with CAFOD and YMT, and people I have only just met this week, and even just this evening. If I am to describe it as one of the most surreal experiences of my life, I wouldn’t be exaggerating. We arrived this afternoon prepped for the overnight vigil expected to have over a million young people attending. When we arrived, we weren’t quite sure how we were going to survive the night. The temperature was at least 41℃ and it showed no signs of cooling. I was confused – people were risking their lives. We saw one young person being taken through the crowds in a fire engine to get to the nearest first aid tent. I couldn’t understand it; surely Pope Benedict would not want people putting themselves in danger just to get a glimpse ? As the day went on, we managed to find a spot near the back of the airfield as our allocated area was too full. 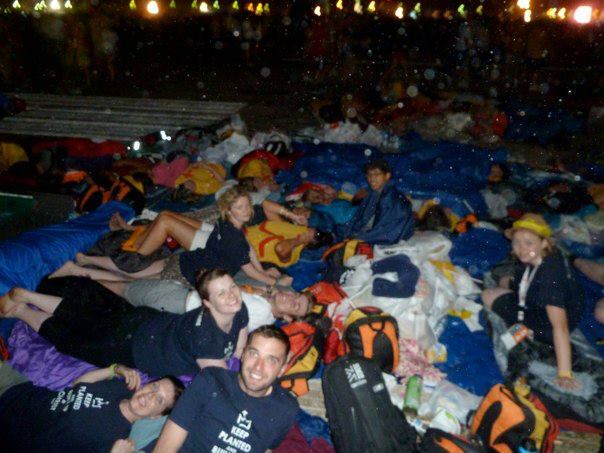 We pitched our sleeping bags, and with the help of a few kind Italians some donated tarpaulin, and sat down on the concrete runway ready for the night ahead. And it was as soon as we sat down that the clouds came over and the weather suddenly began to change. Just in time for the Pope’s arrival, it began to cool down and we could enjoy the surroundings and the camaraderie between our group from Hexham & Newcastle and the group of Canadians from Vancouver who were next to us. When the Holy Father arrived, the heavens opened and we were treated to a thunderstorm. We had to cover our rucksacks with the tarpaulin we were given and use the remaining sheet for cover. It was like something out of a blockbuster film – the wind was blowing through everybody’s hair; shouting at each other to be heard. People were running frantically up and down the runway to get back to their groups to shelter – it actually made for entertaining viewing, if only we weren’t soaking wet ourselves, shivering as the temperature got cooler and cooler. There was a point during the storm where we started to sing the Newsboys song “Glory, glory, hallelujah, He reigns!” and all the other songs and hymns we knew that had the word “reign” in them. God must have heard our singing, as shortly after the rain died down and the Blessed Sacrament was brought out for adoration, the atmosphere changed entirely. We were sat fairly near the back, and were unable to hear (or understand) any of what Pope Benedict was saying to the young people. But when Christ was brought out in the gigantic, pure gold monstrance (which we had visited earlier that week at its home in the Cathedral in Toledo) all the pilgrims, which by the end of the vigil was estimated to be around two million, fell into silence to pray in front of the Blessed Sacrament. And then it dawned on me that people weren’t there to glimpse the Pope at all. We were there to unite in solidarity with the hundreds of thousands of other young Catholics to have an encounter with God, to walk with Christ through the testing weather conditions, the airfield covered in ant nests, our hard concrete bed for the night… suddenly, none of these worries mattered anymore. What was important was sharing this experience together, and filling ourselves with joy, love and unity so we could come home and share what a touching experience it really was. Throughout the evening, you could walk up and down the runway and feel like you were in a carnival. African dancing, Spanish singing, Chinese lanterns, English conversations; every nationality under the sun was there that night celebrating their culture, celebrating their faith. I enjoyed closing my eyes, and simply listening to what I could hear around me; appreciating the richness of our one world. Pope Benedict summed it up the best when, deviating from his pre-written homily, he told the crowds of young people that “your strength is stronger than the rain”. Experiencing the tranquillity and peace during the Blessed Sacrament and being surrounded by pilgrims from all over the planet battling together through the extreme weather conditions really speaks to me that God will be with us no matter what the weather is like, no matter what our situations are in life, no matter how stormy things get. He is alive and present in our Church, in our communities, and in our young people. Mathematician? Check! Loves computers? Check! Campaigning for social justice? Check! You wouldn’t be mistaken if you had just thought I was running through a list of my own interests. Yet, imagine our surprise when myself and my friend Tom met our host families on our first night at the San José Obrero parish in the city of Toledo and discovered that our hosts have lived incredible lives doing the work and studying the subjects which the pair of us have only recently begun to embark upon ourselves. Antonio Vargas and his wife Maria Antigua Diaz welcomed us into their home during the part of the World Youth Day celebrations known as “Days in the Diocese”. The idea is to stay with host families in order to get a real sense of what life is like being a Catholic in the host country. Tom and I stayed in the bedroom once occupied by their son Alberto when he was younger – a typical Spanish teenager’s bedroom; it differed massively to our own, especially in the fact that each bed had three sets of blankets! Having volunteered for CAFOD for over two years now, I was very keen to discover anything I could find out about Manos Unidas, CAFOD’s Spanish sister agency. When I saw a Manos Unidas carrier bag draped over the dining room chair I was quick to ask about the organisation. After help from their English speaking son, we discovered Maria was the Diocesan Manager for Manos Unidas in Toledo. We were living with our very own version of Anne-Marie Hanlon (our CAFOD Diocesan Manager back home in Hexham & Newcastle)! 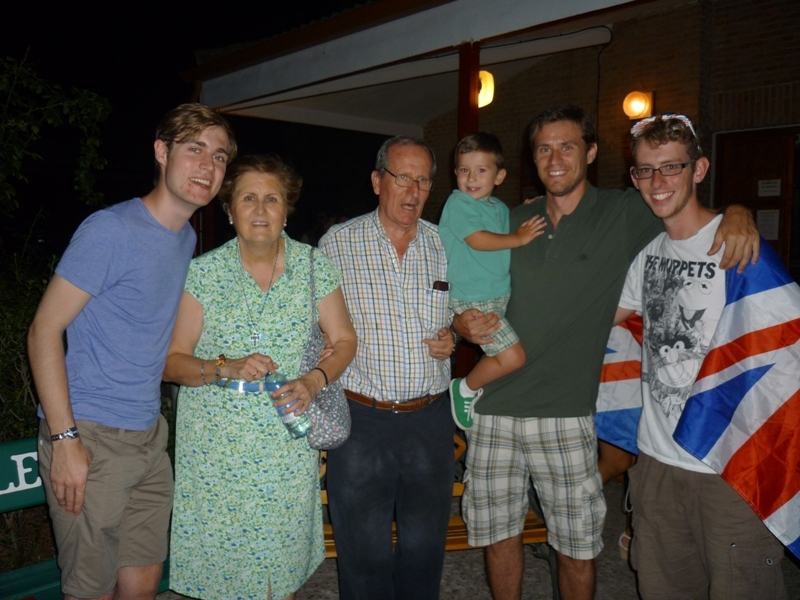 Not only did our Spanish grandparents have connections to CAFOD but our host “abuelo” (“grandad”), is a doctor of Mathematics – a subject which I currently am studying at University! 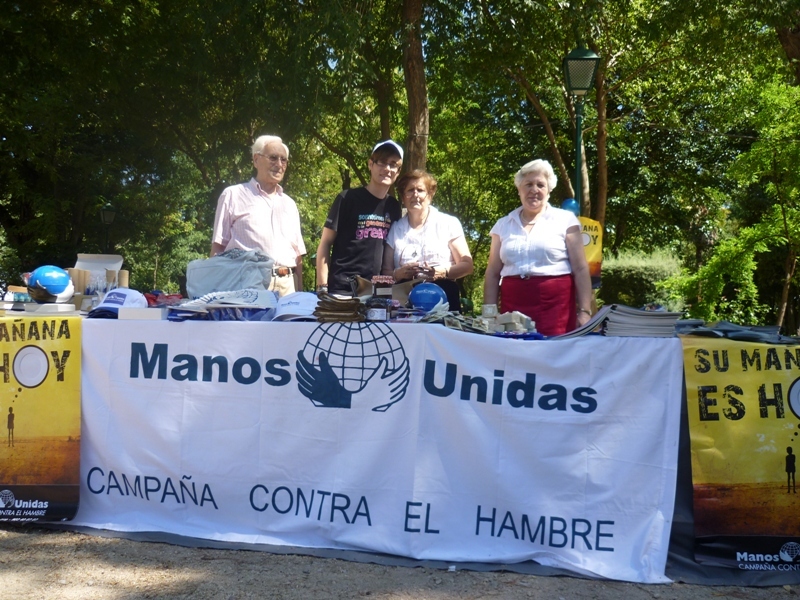 On our final day in Toledo, we even got the chance to help set up the Manos Unidas stall in preparation for the ‘sending forth fiesta’ which took place on Monday night before everyone travelled either overnight or the following morning through to Madrid. It was something I was very used to: setting up tables, putting up campaign posters and putting prices on all of the merchandise. I came away with a couple of t-shirts and a cap which I have been wearing every day since the fiesta. Part of the reason the “Days in the Diocese” seemed to work so well was because we were praying as a community in the parish of San José and living as smaller communities with all of our host families. The work CAFOD does with developing countries is not at all dissimilar to what we were experiencing in Toledo. We have made friends for life out of the people who we have lived with and hopefully we will be able to keep in touch. We were seeing World Youth Day on a small scale and saw how building relationships with people outside of our normal social circles is something that is incredibly important not just for achieving peace, but also for the nourishment of our faith. Picture the scene: A hot, sticky August afternoon in a beautiful yet crowded Spanish city. You stand surrounded by a near two million strong delegation of young people representing almost every country on Earth. The atmosphere is electrifying; hearing chatters in different languages, watching people from different cultures trying to communicate and people exchanging tokens, badges, bracelets from their native lands. Here are just a few of the images that have been promised to me when I attend the World Youth Day celebrations in Madrid this coming summer. 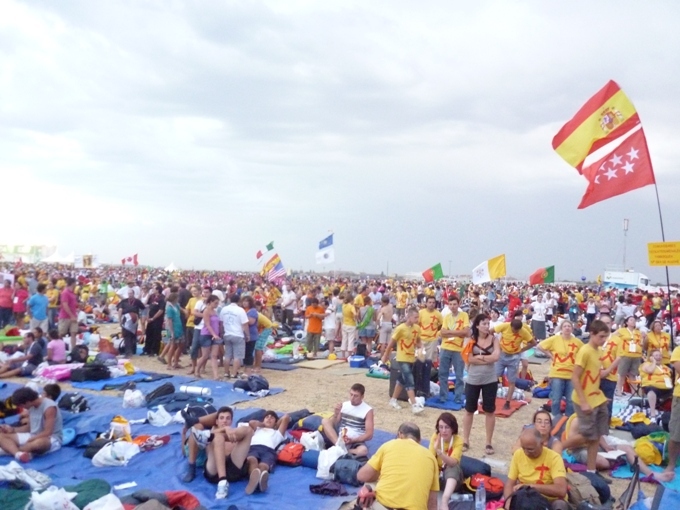 From August 16–21, 2011, approximately two million young people are expected to descend on the Spanish capital to join each other and Pope Benedict XVI to celebrate our faith together. On the schedule is music, prayer, guest speakers, plays, and so much more, all topped off with a final celebration of Mass on the last day. Personally, I cannot wait to arrive! I always think that the only way we are going to achieve peace in our world is if we strike up conversations and make friends with people and World Youth Day (WYD) is an ample opportunity to do just that. 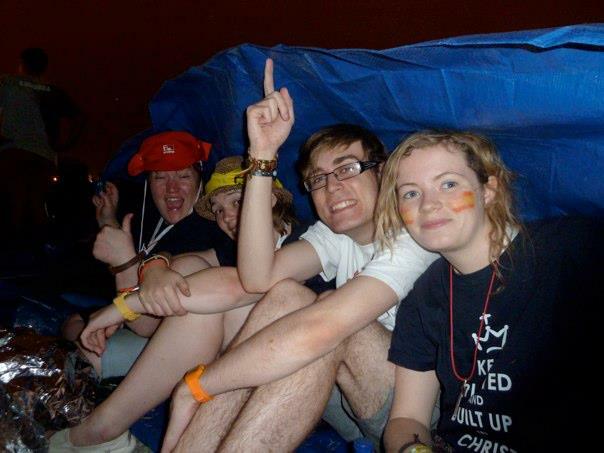 In January 2010, I was given the chance to visit Liberia with CAFOD and work with other young people my age. So, imagine my surprise and delight when I log on to the official WYD website and discover three Liberian young people are registered to go to Madrid. 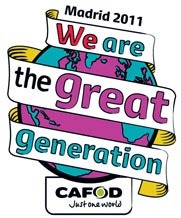 In fact, according to the website 46,815 young people from the 40 CAFOD partner countries are expected to be attending the celebrations – wow! So for that reason, why I want to go to Madrid this summer is simple – I am truly looking forward to meeting as many different like-minded young Catholics from around the world. It’s not often we get the chance to meet many other Catholic young people outside of our parishes, schools or universities yet here is an opportunity to really get a sense of how international our faith can be. We all come from different backgrounds – rich, poor, educated, uneducated, access to clean water, you get the idea – but what isn’t so different about us is our commitment to our faith; our passion to praise God. I am reminded of the scene in the Nativity when all different kinds of people (the lowly shepherds, the rich wise men…) start on a pilgrimage to get a glimpse of Christ. Not only will I get a chance to meet people from around the world, I will also get a chance to pray with them, worship with them, and reflect with them much like the pilgrims did that night in Bethlehem. What better experience could I ask for to really appreciate the feeling of global fellowship and harmony? I don’t think there is one.